5 Bedroom Detached House For Sale in Halstead for Offers in excess of £695,000. Dating back to the 1500's "Old Drawell Cottage" was formerly two separate cottages, which have since been converted in to one substantial property. The character features are ever apparent as you tour the cottage, with exposed timbers, two inglenook fireplaces and a rumoured Priests Hole in the Entrance Hall. There are a choice of five bedrooms and two bathrooms serviced by two staircases and to the ground floor several reception rooms, which benefit from an increase in head height from the lowered floor level, stylish kitchen and utility room. The property has been lovingly restored by the current seller with incredible attention to detail. Further to the main body of the house, there is also a separate outbuilding currently used as a large games room, an adjoining treatment room or studio with separate WC. This building links the garden store, workshop and double Oak Cart Lodge. The enviable plot is approaching 3/4 of an acre and a vast amount of the grounds are laid to lawn with mature tree and hedge borders. At one end of the garden there are several fruit trees at the base of which a vast swathe of snowdrops and bluebells carpet the ground in the Spring. The property is approached via double electric gates through the block paved driveway and ending at the Oak framed double Cart Lodge beside the property. The spacious and welcoming reception hall is a perfect introduction to the character and period charm to follow. The Suffolk White Brick flooring surrounding the wonderful inglenook fireplace provides a hard wearing and attractive flooring when entering from the grounds. There is rumoured to be an original Priest Hole in the curved wall of the inglenook adding to the properties fascination. In the corner of the room there is a very useful storage cupboard. The dual aspect sitting room has windows to both the front and rear aspects with views across the grounds. The main feature of the room is the inglenook fireplace complete with wood burning stove and open flu. Original timber beams frame the ceiling. The first of two staircases can be found in the corner which lead to two of the five bedrooms and a bathroom. A door leads through to the formal dining room. With exposed timbers dating back hundreds of years, the traditional cottage feel of the formal dining room truly shines through, with ample space for a family sized dining table and chairs and windows to the front, side and rear. There is also a door through to the office. The generous size home study is at the rear of the property, allowing for peace and quiet whilst working, a side door through to the driveway and outbuilding allows direct access if clients or customers need to visit the home office without going through the main body of the home. The stylishly re-fitted kitchen mixes oak work units and granite worktops, with ample space for all white goods and some fitted appliances. The room is filled with light from the dual aspect windows across the grounds and a door leads to the inner hallway. Due to the age and character of the property the walls are of wattle and daub construction and the sellers have made a feature window into the wall to showcase the craftsmanship of the build. A very welcome addition to the kitchen is the independent breakfast room, less formal than the dining room and conveniently next to the kitchen, this is the ideal place for weekday dining. The Suffolk White bricks flow through from the reception hall making this a hard wearing and low maintenance room perfect for the high level of activity expected for a room of this nature. There is also a large storage cupboard located in the corner of the room. Located at the rear of the property and giving access to the utility room, ground floor bathroom and kitchen, there are also stairs to three of the bedrooms and a rear access door to the back of the property. Always a useful addition to a property allowing for more storage space in the kitchen by freeing up white goods space. There is plumbing in here for washing machines and tumble dryers, as well as a wall hung sink unit. The first of two bathrooms is located on the ground floor and offers a four piece suite comprising; panel enclosed bath, low level WC, pedestal wash hand basin and separate shower enclosure. Although a more recent addition to the property, the suite still fits perfectly within the character of the home. From the stairs located in the sitting room, The room currently used as the master can be found on the right off of the landing. A generous size double bedroom with a large cupboard extending through the wall and linking with a bedroom on the other side. The character of the property still shines through. Opposite bedroom one is a further double bedroom with similar character features, exposed floorboards and with a window to the side of the building. The first floor bathroom services both bedrooms in this wing of the property, also incorporating the airing cupboard. The suite includes; a panel enclosed bathtub, low level WC, pedestal wash hand basin and heated towel rail with radiator. From the inner hallway, the stairs lead to a small landing with doors to two bedrooms. Bedroom three is on the right hand side at the top of the stairs. Again a double room with character features and the other side of the cupboard that links this bedroom with bedroom one. Bedrooms four and five are linked through an opening and would make for an ideal children's bedroom and playroom. You first enter bedroom four from the landing, there is a window to the side and built in cupboard. With exposed floorboards and timbers the character is still ever apparent. With exposed timber roof beams. Linked to bedroom four and an ideal place for a play room or children's bedroom. The left side of the outbuilding is a large and versatile room currently used as a games room. There are French doors and a window to the front and an interconnecting door through to what is currently used as a treatment room. There is a front door in to the room from the driveway and a window to the front. Being independent from the main property this ideally suited for visitors and would offer a multitude of uses. Servicing the outbuilding the separate and enclosed bathroom offers a low level WC and vanity unit wash hand basin. The enviable plot is approaching 3/4 of an acre in size and borders countryside and agricultural views far reaching into the distance. A vast amount of the grounds are laid to lawn with mature tree and hedge borders. At one end of the garden there are several fruit trees at the base of which a vast swathe of snowdrops and bluebells carpet the ground in the Spring. Also found are landscaped flower beds and raised planters as well as a large ornamental pond which is currently drained. 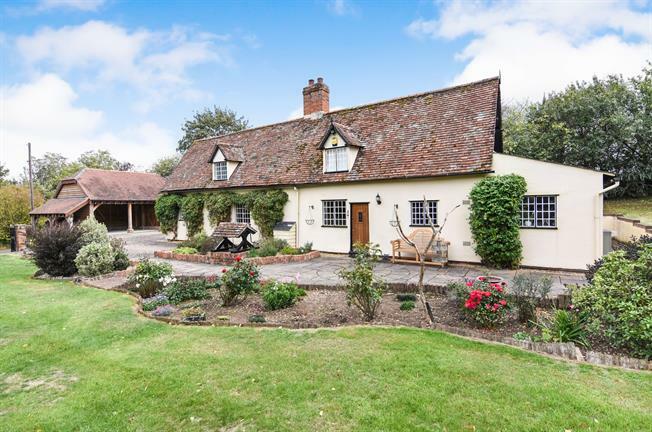 The property is approached via double electric gates through the block paved driveway and ending at the Oak framed double Car Lodge beside the property. Through the electric double and gates and following the block paved driveway, you will arrive at the double Oak Framed Cart Lodge providing undercover parking for two large vehicles and ample further parking on the driveway.